Children’s Theatre Partnership. Goodnight Mr Tom. The Children’s Theatre Partnership (CTP) announces the support of Arts Council England (ACE) over a three-year period from 2020 to 2022 to continue producing exciting new productions especially created for young and diverse audiences throughout the UK. The Children’s Theatre Partnership was originally established in 2010 as a partnership between Fiery Angel and Chichester Festival Theatre to produce and tour bold, ambitious and imaginative theatre for young people, families and schools. Its mission continues to become a reality, and with the support of Arts Council England, CTP is thrilled to announce three UK tours including a re-mount of Nottingham Playhouse’s acclaimed production of “HOLES” by Louis Sachar and two new commissions: George Orwell’s “ANIMAL FARM” and Michael Rosen’s “AN UNEXPECTED TWIST”. The success of CTP lies in its close relationships with a loyal network of venues around the country. During this three-year period, CTP will co-produce with Nottingham Playhouse, Bristol Old Vic, Curve Theatre and Royal & Derngate, Northampton. Since 2010 CTP has successfully produced and toured five shows and brought two to the West End. CTP has developed a network of supportive large-scale venues, reaching over 500,000 people. 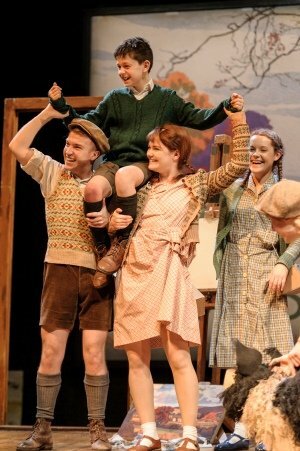 Previous CTP productions include the Olivier award winning “Goodnight Mr Tom” which enjoyed a successful West End run and three UK tours, a West End and UK tour production of “Swallows and Amazons”, a UK tour of “The Boy in the Striped Pyjamas”, a UK tour of Michael Morpurgo’s “Running Wild”, followed by a UK tour of “The Jungle Book”. Edward Snape, Director of Fiery Angel said today, ‘The support of Arts Council England is testament to the need for the work that CTP creates for young audiences and for loyal venues around the country who have supported CTP’s vision. Three Year funding enables us to commission exciting new shows, collaborate with our partners to build new audiences and run a full education programme that we hope will inspire young people to become actively involved in the arts. We are excited to get started and truly grateful to ACE for their support in aiding CTP to continue its legacy of creating great theatre for a young and diverse audience’. Ruth Eastwood said today, ‘Our core mission at the Blackpool Grand is to inspire a life-long love of theatre. Being a member of CTP’s new advisory board allows us to continue with this mission and inspire future generations with the power of theatre’. And Philip Bernays says, ‘I am incredibly passionate about the need for quality drama in our programme. There is precious little of it around at the large scale, and even less for younger audiences. We value enormously the work of CTP bringing shows of relevance and quality for young people. Work like that of CTP helps to balance and diversify our programme, introducing new audiences to theatre’. Louis Sachar’s “HOLES” will be CTP’s first production to tour the UK, opening January 2020 and will be directed by Adam Penford. George Orwell’s “ANIMAL FARM” will tour from January 2021 and Michael Rosen’s “AN UNEXPECTED TWIST” will be the third production from CTP and will tour from January 2022. The Children’s Theatre Partnership is supported using public funding by the National Lottery through Arts Council England.